When rice is cooked, place in large bowl. Add coconut milk, sugar, can of lychee fruit and 1/4 cup of reserved lychee syrup; stir until sugar is dissolved. To serve, place sticky rice on platter and garnish with sliced chopped fresh mango. One of my favorite flavors of boba tea (aka bubble teas, flavored drinks with large tapioca pearls) is mango lychee. Since I’ve been having fun concocting ice cream flavors, I figured boba flavors would work just as well in ice cream form. To make my mango lychee ice cream, I used a common base of heavy cream and whole milk. Using the light syrup that the lychees were packed in added the subtle sweetness and a touch of mango extract added a hint of color and enhanced the flavor of the mango I used. 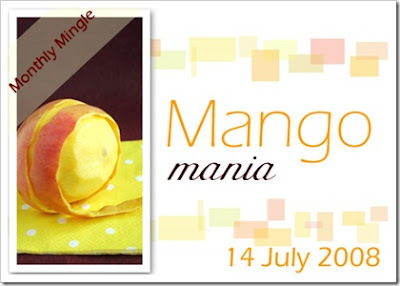 I’m also submitting this recipe to Meeta’s Mango Mania blogging event! Be sure to check out the round up later this month on her site that will be full of recipes using mango, one of my favorite fruits. In a blender, process syrup and mango until pureed. On low, add lychee fruit and pulse – do not over process. In a bowl, whisk milk and sugar until sugar is dissolved. Add fruit puree mixture and cream. Stir in extract until color is unified. Place in ice cream maker and process per manufacturers directions. Freeze mixture in freezer-proof containers for 2 hours to “ripen”.